The marvellous times you spend with your family during holidays or vacations are cherished because of their sheer levels of excitement, pleasure and relaxation. Shimla, the capital city of Himachal Pradesh, is one of India’s most favoured destination places among the majority of travellers. It is renowned for its beauty and serenity that are class by themselves. As a quintessential weekend holiday destination, Shimla caters to a large spectrum of travel enthusiasts, by offering them with a profusion of things to do in Shimla. Here’s a rundown of four most preferred ones. This one has to be a compulsory inclusion in your weekend trip itinerary. The experience of the toy train ride is so mind-blowing that it should not be missed. The journey from Kalka to Shimla can simply give you goosebumps as the train pirouettes through numerous tunnels amid the rocky laps of the mountains. The escapade is all but magical, idealized and dreamed-up. When the train passes through the breathtaking stations of Barog, Solan and Dharampur, the mythical scenery adds to an invigorating holidaying experience. Embarking on a short trek and climbing up to the Jakhu Temple is a beautiful experience to perk you up. The Hanuman Temple that is ensconced on a hilltop nearly at an altitude of 2455 metres is a prominent spectacle in Shimla. You can also take the Jakhu ropeway in Shimla to reach the temple. The intriguing journey through the ropeway renders a spellbinding panorama of the lofty Shivalik Ranges and the picturesque town of Sanjauli that cradles the Jakhu Temple. The awe-inspiring and mammoth 108 metres tall deity has an unmistakable magnetic appeal. Much akin to its name, Lakkar Bazaar is a prominent wood market in Shimla. The market is brimful with shops that sell decorative wooden artefacts, showpieces and walking sticks. It’s the perfect place where you can take your family for an astounding shopping extravaganza. The market boasts of everything under the sun starting from cheap and affordable items like a tiny wooden key ring to more expensive elaborate items of home décor. According to your budget, you can buy fancy native products as tokens of an everlasting remembrance. 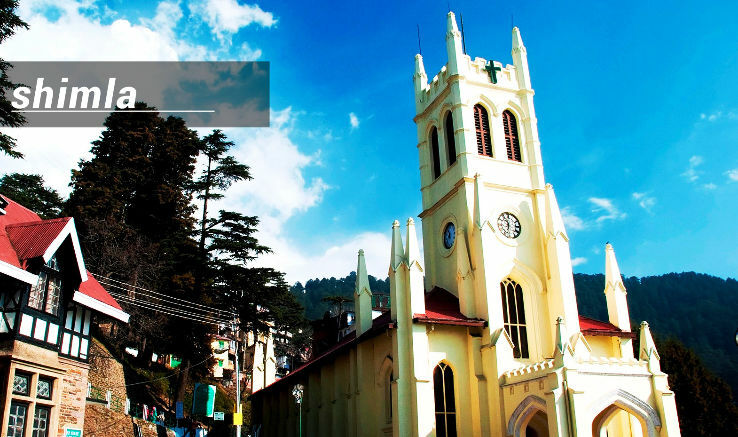 Shimla is famous for its pre-eminent buildings made of colonial architecture from the British era. A stand-out among them is the Gaiety Theatre that epitomizes and keeps alive exemplary British architecture and building design. Well-known British architect Henry Irwin constructed the theatre with a seating capacity of 300 in the year 1877. You can appreciate the overall framework that comprises of a museum, amphitheatre,conference hall and multipurpose theatre. Go for a guided tour to learn the underlying history of this ancient splendour. Cast a bird’s eye view on the entire architectural wonder, especially from the Viceroy’s Box. Choose Shimla as the next weekend holiday destination for your family to whip up yet another soul-stirring memory of recreation and contentment.